Taking up a quarter of the entire Russian landmass, the Arctic regions exert a mythic pull on the Russian imagination. 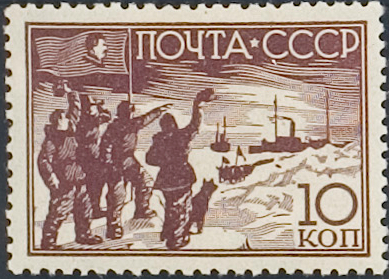 In the 1930s, Soviets made history in the Arctic. The Arctic adventure had the entire country enthralled over the heroic exploits of polar explorers and aviators. In 1934, Soviet aviators staged an unprecedented rescue mission evacuating stranded passengers of the Soviet steamer Cheliuskin that was attempting to travel through the frozen Northern Maritime Route. In 1937 pilot Mikhail Vodopyanov, became the first in the world to land a plane at the North Pole. 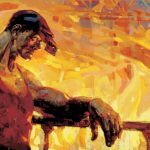 He brought to the Arctic Ivan Papanin’s party, who embarked on the most unusual and exciting expedition in the history of polar exploration.Papanin drifted on an ice floe through the Polar Regions for 234 days making scientific observations. In the same year, Soviet pilots captured the world record for long-distance aviation; Valery Chkalov made the first non-stop flight over the North Pole from Moscow to Vancouver, WA, covering 5,475 miles in 63 hours on a Tupolev ANT-25 plane. Airplane Route from Moscow to North Pole. North Pole (Северный полюс). Soviet Flight to the North Pole. 1938, Feb. 25. USSR. Scott#625. Private American Collection.